Like the large-vocabulary speech recognition paper we looked at yesterday, today’s paper has also been described as a landmark paper in the history of deep learning. It’s also a surprisingly easy read! The ImageNet dataset contains over 15 million labeled high-resolution images of objects in roughly 22,000 categories. The annual ImageNet Large-Scale Visual Recognition Challenge (ILSVRC) competition uses a subset of ImageNet with roughly 1000 images in each of 1000 categories. There are 1.2M training images, 50,000 validation images, and 150,000 testing images. For reporting error rates, a model predicts the top 5 most likely labels. The ‘top-5’ error rate is the fraction of test images for which the correct label is amongst this top 5, and the ‘top-1’ error rate is the fraction of test images for which the correct label is the one judged most likely by the model. Using an eight-layer neural network with five convolutional layers, the authors achieved top-1 and top-5 error rates on the ILSVRC-2010 dataset of 37.5% and 17.0% – considerably better than the previous state-of-the-art at 45.7% and 25.7% respectively. The model was trained using two GPUs. (In the 2014 ILSVRC competition a 19-layer CNN achieved a 7.5% top-5 error rate. In the 2015 competition, an ensemble containing 152-layer networks achieved a 3.57% top-5 error rate!). Our results show that a large, deep convolutional neural network is capable of achieving record-breaking results on a highly challenging dataset using purely supervised learning. 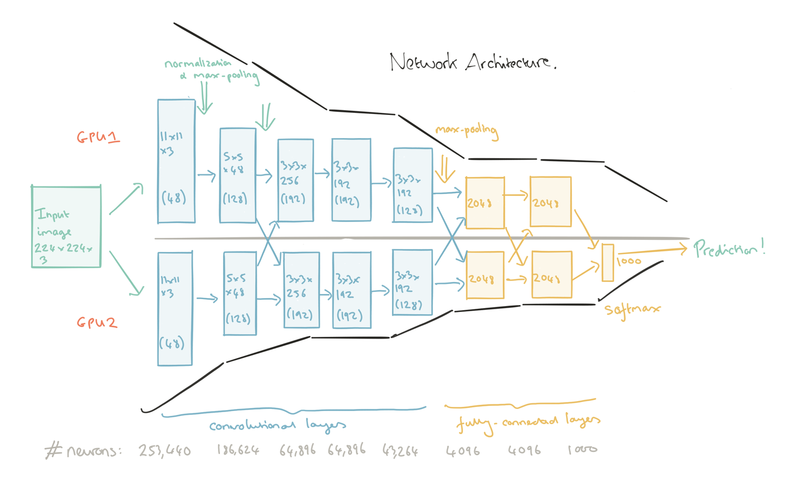 It is notable that our network’s performance degrades if a single convolutional layer is removed. For example, removing any of the middle layers results in a loss of about 2% for the top-1 performance of the network. So the depth really is important for achieving our results. To simplify our experiments, we did not use any unsupervised pre-training even though we expect that it will help, especially if we obtain enough computational power to significantly increase the size of the network without obtaining a corresponding increase in the amount of labeled data. At test time, the network makes a prediction by extracting five 224×224 patches (the four corner patches and the center patch) as well as their horizontal reflections (hence ten patches in all), and averaging the predictions made by the network’s softmax layer on the ten patches. Let’s take a look at the structure of the network, and how data flows from input images to final classification prediction. (click on the image for a larger view). The first five layers of the network are convolutional, and the last three are fully connected. The output of the last layer is fed to a 1000-way softmax which produces a distribution over the 1000 class labels. The first convolutional layer filters the 224×224×3 input image with 96 kernels of size 11×11×3 with a stride of 4 pixels. The second convolutional layer takes as input the (response-normalized and pooled) output of the first convolutional layer and filters it with 256 kernels of size 5 × 5 × 48The third, fourth, and fifth convolutional layers are connected to one another without any intervening pooling or normalization layers. The third convolutional layer has 384 kernels of size 3 × 3 ×256 connected to the (normalized, pooled) outputs of the second convolutional layer. The fourth convolutional layer has 384 kernels of size 3 × 3 × 192 , and the fifth convolutional layer has 256 kernels of size 3 × 3 × 192. The fully-connected layers have 4096 neurons each. The following figure shows the 11x11x3 convolutional kernels learned by the first convolutional layer. The top 48 kernels were learned on GPU 1, while the bottom 48 kernels were learned on GPU 2… The kernels on GPU 1 are largely color-agnostic, while the kernels on GPU 2 are largely color specific. This kind of specialization occurs during every run and is independent of any particular random weight initialization. For the pooling layers, it is traditional to use non-overlapping neighbourhoods. To be more precise, a pooling layer can be thought of as consisting of a grid of pooling units spaced s pixels apart, each summarizing a neighborhood of size z x z centered at the location of the pooling unit. If we set s=z we obtain traditional local pooling as commonly employed in CNNs. If we set s < z we obtain overlapping pooling. The authors use s = 2, z = 3 and found that this reduces the top-1 and top-5 error rates by 0.4% and 0.3% respectively compared to the non-overlapping s = z = 2 scheme. “We generally observe during training that models with overlapping pooling find it slightly more difficult to overfit.” Another technique used to combat overfitting is dropout. It simulates the effect of combining the predictions of many different models: > The recently introduced technique, called “dropout,” consists of setting to zero the output of each hidden neuron with probability 0.5. The neurons which are “dropped out” in this way do not contributed to the forward pass and do not participate in backpropagation. So every time an input is presented, the neural network samples a different architecture, but all these architectures share weights. At testing time, all neurons are used with their outputs multiplied by 0.5. This approximates the geometric mean of the predictive distributions produced by the exponentially-many dropout networks. We use dropout in the first two fully-connected layers… Without dropout, our network exhibits substantial overfitting. Dropout roughly doubles the number of iterations required to converge. The standard way to model a neuron’s output f as a function of its input x is with f(x) = tanh(x) or f(x) = (1+e-x)-1. In terms of training time with gradient descent, these saturating nonlinearities are much slower than the non-saturating nonlinearity f(x) = max(0,x). ReLUs do not require input normalization to prevent them from saturating, but the authors found that a local normalization scheme aided generalization. Response normalization reduces the top-1 and top-5 error rates by 1.4% and 1.2% respectively. …Another way to probe the network’s visual knowledge is to consider the feature activations induced by an image at the last, 4096-dimensional hidden layer. If two images produce feature activation vectors with a small Euclidean separation, we can say that the higher levels of the neural network consider them to be similar. Figure 4 shows five images from the test set and the six images from the training set that are most similar to each of them according to this measure. Notice that at the pixel level, the retrieved training images are generally not close in L2 to the query images in the first column. For example, the retrieved dogs and elephants appear in a variety of poses. We present the results for many more test images in the supplementary material. Hello, Thank you very much for the nice explanation. I just have a confusion between the Objective plot and Top-1 error plot while the training. What it shows exactly if converging to zero. is NOT among the five labels” for top-5 error rate ? Yes, you’re absolutely right – it’s the # times the correct image does *not* appear in the top-n! I’ll update the post as soon as I get a chance. Tks. Good catch, thank you! I’ve updated the post. Rgds, A.